How many doodlers and illustrators do you follow on Instagram? And how many times have you tried to doodle but thought you’d do so much better with some help? This is your chance to shine on. Learn to make cute doodle arts with the guidance of experts while you make your own masterpiece. 'The Craftsutra' is hosting this amazing workshop and you can be a part of it. What To Expect At The Doodle Workshop? A two-hour workshop that focuses on the theme of mindfulness through a creative channel of doodling. We will start with some ice breaking sessions so that everyone gets comfortable with each other. We will be doing a game of Pictionary. We’ll make a card with various thoughts, feelings, ideas - simple to draw and an interesting way to understand how different people interpret situations that are common for most of us. We’ll then move on and focus on how we can incorporate creativity into our everyday lives. This could be through various mediums of art like music, videos, writing poetry etc. During this phase, we want to stimulate the minds to understand surroundings better - imbibing whats around you makes you more aware and that fills your memory with vivid thoughts and images. We will test this by doing a few visualisation exercises. For example, we'll make people listen to music and ask them to doodle their interpretation. Then we can have a comparison exercise to understand how different people evaluate and observe the same surroundings. Finally, we'll conclude the workshop by focusing on pure doodle exercises. We'll teach people common doodle connectors and how to create meaning or a story out of what they doodle. We'll ask them to finally doodle their most memorable part of the workshop and that can become a souvenir. 'The Craftsutra' is a platform for people to engage in Arts, learn and acquire a new skill, meet, and bond with like-minded people. We believe that anyone can create Art and look forward to offering you the opportunity to paint, create, learn and explore art in a way like never before. 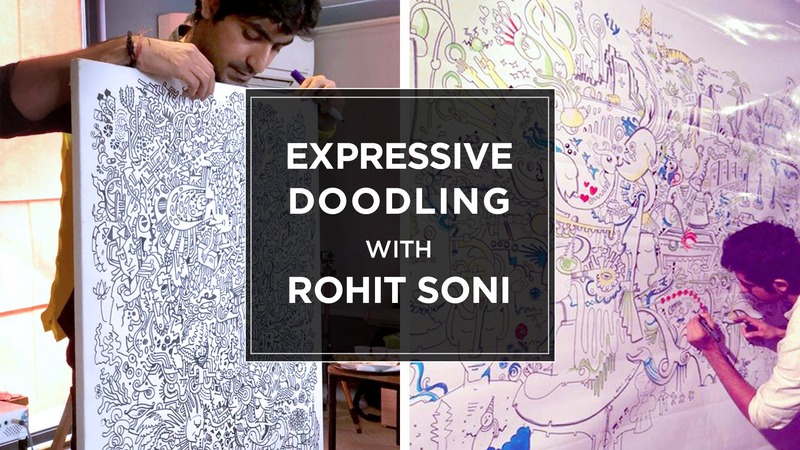 An innovator at heart, Rohit Soni loves to create and design visuals that invoke a sense of introspection and engagement. After completing his graduation from NIFT, he did his Masters in Interaction Design from IIT, Mumbai. He has developed a presence in the art world for his unique style of illustrations – Surreal, clean and slick with harmonious color schemes. He has done a lot of live doodle art at various events globally, apart from a number of visual harvesting and branding projects. Personally, he loves running and reading about cultures, cognitive sciences, and traveling. Registration is absolutely free! Just click on that 'Register' button and fill in the details.